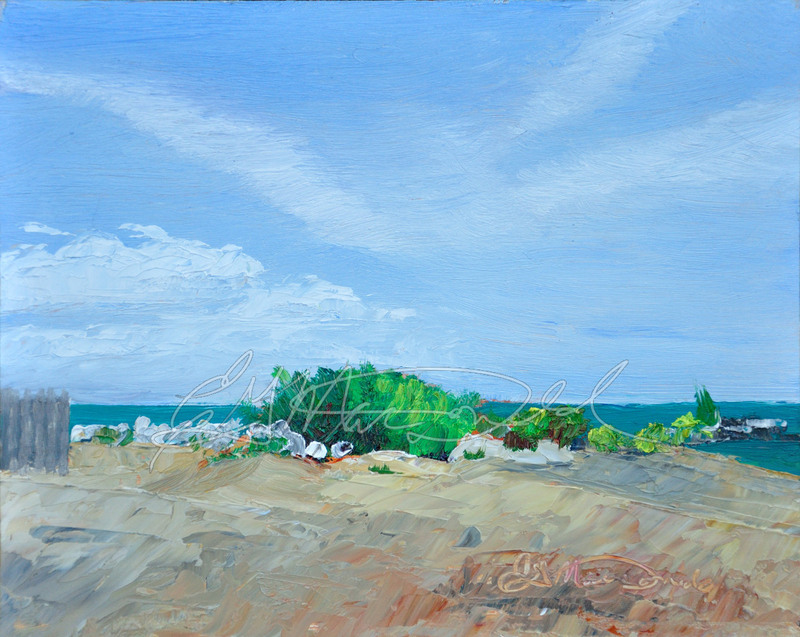 Monday’s paint out was at one of my favorite locations to paint, Cedar Beach. The wind was pretty stiff and the sun was hot, but my umbrella kept me cool and prevented me from a nasty sun burn. I like the results. A Day at the Beach, 8 x 10 oil on panel. I painted 4 paintings during the week, and started on a commission. I could have painted more except we had rain Monday and Tuesday. I painted 3 evenings on Nocturne paintings. First time ever for a nocturne and it was loads of fun, except it was freezing cold in the 50’s. The most exciting part is that all 5 of my paintings from the week (commission included) SOLD!!! What an incredible week! I had so much fun. It was also a grueling week. Standing from 8 A.M. until Midnight at my age is quite painful and exhausting, but I survived. We had some real cold weather where the temperatures dropped into the 50’s. I chose to paint a nocturne, and I got a commission while painting it, so I ended up painting in those cold conditions for three nights in a row. I developed laryngitis, but thankfully I got my voice back quickly. The voice probably was from talking as well. There were a lot of visitors to my easel. One gentleman brought me pizza while I was painting at night! It was YUMMY! Dexter has great pizza.